Electronic and mechanical switches are used for monitoring critical limit values and therefore usually fulfil a safety function. To meet this safety function, switches offer two alternative switching functions, the “hysteresis” and the “window” functions. In general, these two switching functions differ from each other in that the “hysteresis” function monitors a limit value and the “window” function monitors a set range.Thus, the switching function “hysteresis” monitors whether a critical value (switch point) has been exceeded. The “window” switching function monitors whether the monitored process is within the set range (within the upper and lower limits = “window high” and “window low”), or whether this set range has been exceeded either above or below. Independently of the setting of the switching function, the switch always changes the switching status (e.g. from active to inactive, or from open to closed) when a limit value is exceeded or the set range is exceeded above or below. Practical examples of the use of a hysteresis function and a window function can be found in the articles “What is meant by the hysteresis switching function in electronic pressure switches?“ and “What is meant by the window switching function in electronic pressure switches?”. In practice, the user must first decide, based on their specific monitoring function, which switching function they want. 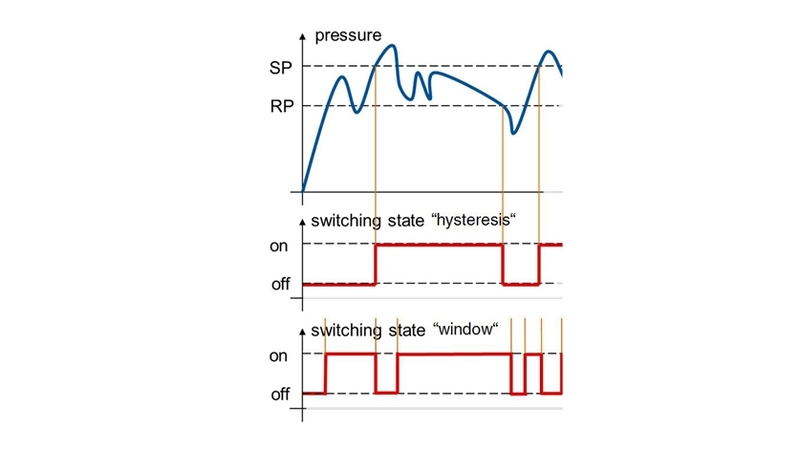 Whereas the switching function of “hysteresis” is included in each switch (whether mechanical or electronic, and whether for the parameter of pressure, temperature, level or flow) the switching function of “window” is only configurable in electronic switches. In the case of mechanical switches, the hysteresis is predefined already by design, while in the case of electronic switches, however, it is also configurable by the end user. Because of the historical importance of mechanical switches and their continued use in simple and often cost-sensitive applications, the switching function “hysteresis” remains the most important and widely used option for monitoring critical set points. Only with the introduction of electronic switches, especially modern pressure switches with integrated displays and control buttons for local configuration, has the switching function “window” become widely used. Your contact person will be glad to assist you with selecting an appropriate pressure switch.